I am going to church, Watson. I believe such attendance was a prominent element of the Christmas season before the giving of gifts and the consumption of certain fowl became de rigueur? If I could work my will every idiot who goes about with ‘Merry Christmas’ on his lips, should be boiled with his own pudding, and buried with a stake of holly through his heart. He should! Oh look, yet another Christmas TV special! How touching to have the meaning of Christmas brought to us by cola, fast food, and beer conglomerates. Who’d have ever guessed that product consumption, popular entertainment, and spirituality would mix so harmoniously? It’s a beautiful world all right. Oh! All that steam! The pudding had just been taken out of the cauldron. Oh! That smell! The same as the one which prevailed on washing day! It is that of the cloth which wraps the pudding. Now, one would imagine oneself in a restaurant and in a confectioner’s at the same time, with a laundry nest door. 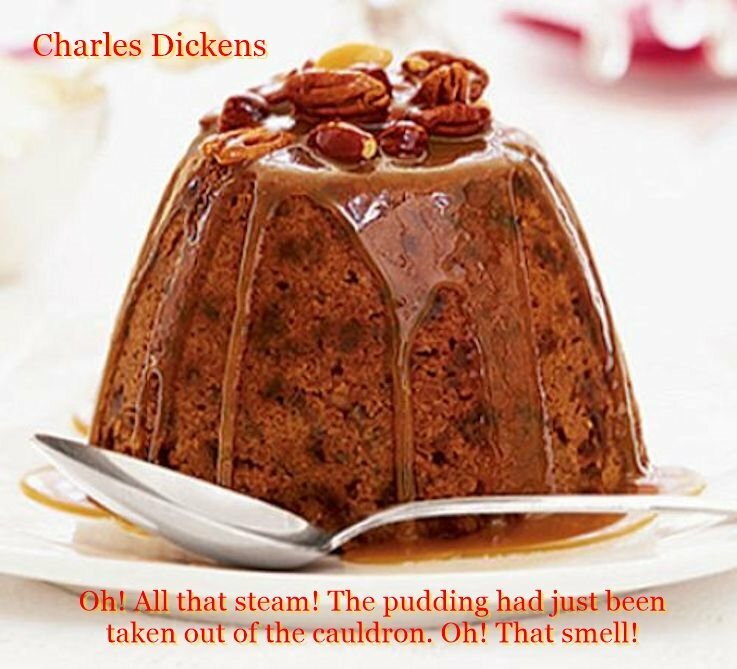 Thirty seconds later, Mrs. Cratchit entered, her face crimson, but smiling proudly, with the pudding resembling a cannon ball, all speckled, very firm, sprinkled with brandy in flames, and decorated with a sprig of holly stuck in the centre. Oh! The marvelous pudding! For many of the islanders, this anniversary is memorable (apart from all religious significance) because it evokes a great slaughter of turkeys, geese and all kinds of game, a wholesale massacre of fat oxen, pigs and sheep; they envisage garlands of black puddings, sausages and saveloys … mountains of plum-puddings and oven-fulls of mince-pies … On that day no one in England may go hungry… This is a family gathering, and on every table the same menu is prepared. A joint of beef, a turkey or goose, which is usually the pièce de résistance, accompanied by a ham, sausages and game; then follow the inevitable plum-pudding and the famous mince pies. In Great Britain today, Christmas is a time for families coming together and with the recently acquired wealth, this event is a great excuse for a boom in buying expensive consumer goods especially for children who normally are at the centre of most of the festivities. 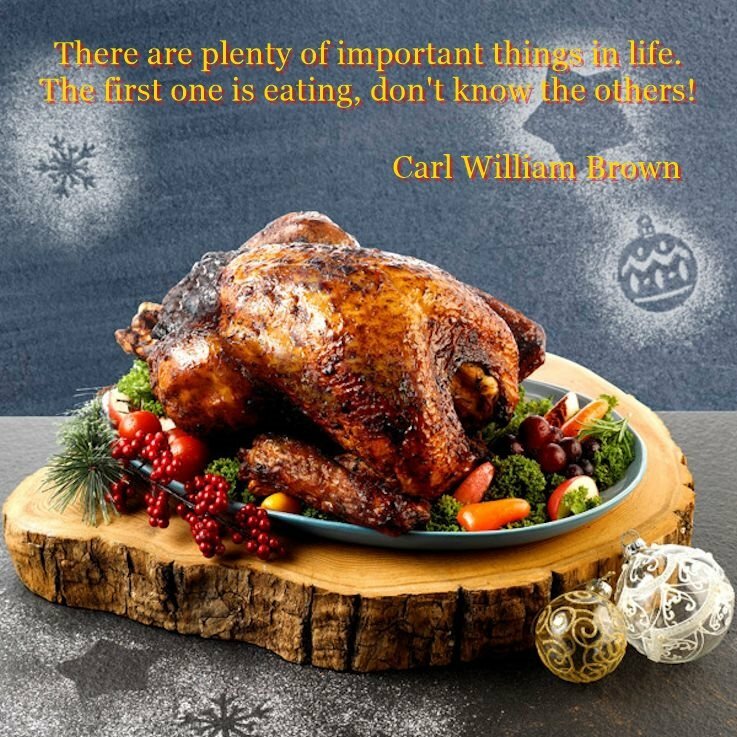 We are very much in the mainstream of Western European customs, taking the Christmas Tree from Germany, the turkey and plum pudding from England – although there was a tradition, especially in rural areas, to have a goose, rather than a turkey. Holly and mistletoe were the decorations at this time of year and thought to have magical properties. The Druidic ceremonies invariably involved mistletoe and was noted by Roman writers. In some areas, Wales for example, on Christmas morning a special service was held in Churches as early as 3.a.m called the Plygain when particular carols would be sung in three or four part harmony – a custom which is still practised somewhere. Christmas time is a traditional moment, so nothing better than preparing only classic dishes on Christmas Day. So, for Christmas morning you can start the day with Bloody Mary, scrambled eggs and smoked salmon, because it’s better to keep things light before the onslaught of roast dinner with all the trimmings. As starters you can prepare some chicken liver, some prawn cocktails lettuce cups and smoked salmon salads. Anyway on this occasion food is certainly the pivotal part of the day. 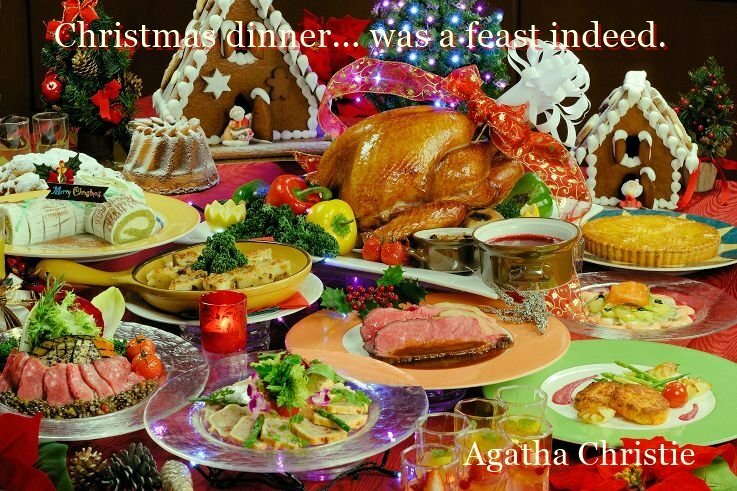 A classic Christmas dinner is the main Christmas meal and is traditionally eaten at mid-day or early afternoon on Christmas Day in England and also in the rest of Britain. After the parcels are opened and after the Queen’s speech at 3pm, the high point of the celebrations can start, a time to gather family or friends together and enjoy the best of British produce. Little has changed over centuries, and the whole dinner is steeped in heritage and tradition. The British sit around wearing paper hats from Christmas Crackers with their silly jokes, and tacky gifts and many still stop to listen to the Queen, and no Christmas is complete without a tray of dates, bowls of nuts and oranges – the first two are rarely eaten but are part of the traditions anyway. 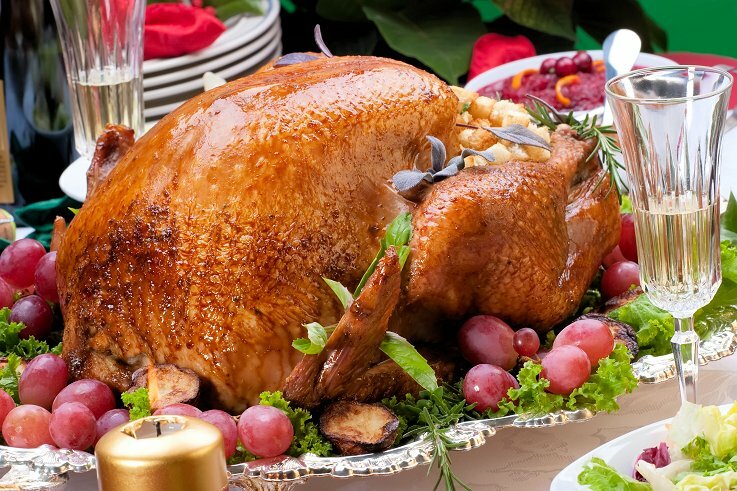 A traditional English and British Christmas dinner includes roast turkey that is a typical Christmas meal, the most common meat, but other birds such as chicken or goose are alternatives; rich nutty stuffing, roast potatoes, brussels sprouts or other vegetables, tiny sausages wrapped in bacon (pigs in a blanket) and lashings of hot gravy to eat with the meat. In Britain, a traditional Christmas cake is a rich fruit cake topped with mazipan and covered with white icing sugar. This is eaten at tea-time (in the late afternoon) on any day shortly before or after Christmas. A Christmas pudding is a traditional pudding. Brandy is sometimes pourred on top and set alight. Rum butter (or rum sauce) and ice cream may be served with the pudding. A common alternative pudding is trifle. 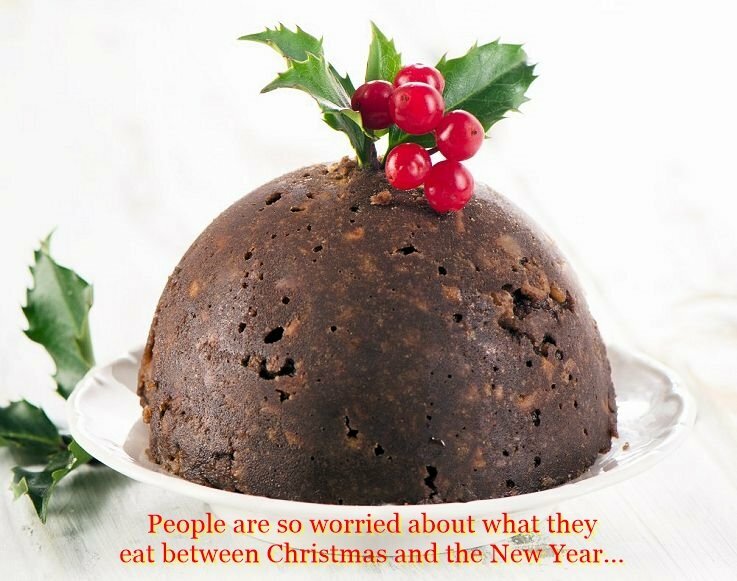 The Christmas Pudding is the traditional sweet eaten in England on the 25th of December. Every family has its own recipe that has belonged to someone who was famous in the family for his/her delicious pudding. There are many curiosities linked to the preparation of this dish: it is good luck to be asked to stir a pudding when it’s being made; it is a custom to add silver coins, or wedding rings, or little silver tokens shaped into buttons to the mixture; it has to be served steaming hot and ablaze, no matter what the climate of the country is; pouring a spirit or brandy over the pudding is a ritual from the past, and it refers to the tradition of the fire worship of the British ancestors. Christmas pudding is a type of pudding traditionally served as part of the Christmas dinner in the UK, Ireland and in other countries where it has been brought by British emigrants. It has its origins in medieval England, and is sometimes known as plum pudding or just “pud”, though this can also refer to other kinds of boiled pudding involving dried fruit. Despite the name “plum pudding,” the pudding contains no actual plums due to the pre-Victorian use of the word “plums” as a term for raisins. The pudding is composed of many dried fruits held together by egg and suet, sometimes moistened by treacle or molasses and flavoured with cinnamon, nutmeg, cloves, ginger, and other spices. The pudding is usually aged for a month or more, or even a year; the high alcohol content of the pudding prevents it from spoiling during this time. Brandy is often poured over the pudding, which is then set a light as it is carried to the table. The lights are turned off so people can see the flames. Christmas Pudding is served with custard or brandy sauce. The Christmas pudding known today began life as Christmas porridge called Frumenty, a dish made of wheat or corn boiled up in milk. As time went on, other ingredients, such as dried plums or prunes, eggs, and lumps of meat were added to make it more interesting. When cooked, it was poured into a dish. This pudding was called Plum Pudding. The name ‘Plum Pudding’ continued to be used even when people used raisins, currants, and sultanas instead of prunes. A proper Christmas pudding is always stirred from East to West in honour of the three Wise Men and traditionally made with 13 ingredients to represent Christ and His Disciples. Every member of the family must give the pudding a stir and make a secret wish. In recent times, however, two-thirds of British children surveyed, revealed that they had never experienced stirring Christmas pudding mix. It comes with their parents’ preference for ready made-mix of puddings available in grocery stores. Here is the legend of this delicious dish. The king was going through a thick forest with his page, when the night came the two men got lost and stumbled upon a woodsman’s hut. The man welcomed them and offered to share his humble porridge. The king ordered his page to add to the pot whatever was left in his saddlebags, because he, too, wanted to share his food, with the poor man. The page obeyed his king and poured some prunes, six eggs, bread crusts, a sprinkling of spice, slices of apples and a generous amount of brandy into the mixture. It was then stirred and served in wooden bowls. Believe it or not, this is how the Christmas Pudding was invented. In the end the king slipped a gold coin under the woodman’s slice to thank him for his warm hospitality. That’s why for a long time it’s been common practice to include silver Christmas pudding coins, charms or tokens into Christmas pudding. Finding a Christmas coin in your slice of pudding is believed to bring good luck and especially wealth in the coming year. Stir-up Sunday is an informal term in Anglican churches for the last Sunday before the season of Advent (4-5 weeks before Christmas). It gets its name from the beginning of the collect for the day in the Book of Common Prayer, which begins with the words, “Stir up, we beseech thee, O Lord, the wills of thy faithful people”. But it has become associated with the custom of making the Christmas puddings on that day. The Christmas pudding is one of the essential British Christmas traditions and is said to have been introduced to Britain by Prince Albert, husband of Queen Victoria (the reality is that the meat-less version was introduced from Germany by George I in 1714). Most recipes for Christmas pudding require it to be cooked well in advance of Christmas and then reheated on Christmas day, so the collect of the day served as a useful reminder. The Christmas pudding remind us in some ways of the Italian panettone (literally meaning “big loaf”) which is a tall, dome-shaped cake risen with yeast. It has a somewhat light and airy texture but a rich and buttery taste, and it’s not very sweet. It’s a typical Christmas-time cake all around Italy and in Italian communities around the world, but it originates in the northern Italian town of Milan. It traditionally contains raisins and candied fruit (orange and citron zest) and is topped with crisp pearl sugar. More modern versions might substitute the candied fruit with chocolate chips. Most Italians do not make panettone at home, for the simple reason that it is a rather lengthy and complicated process, requiring multiple risings. Usually, it is bought from a local baker or in a supermarket.